We spotted a new Free Fridays coupon! 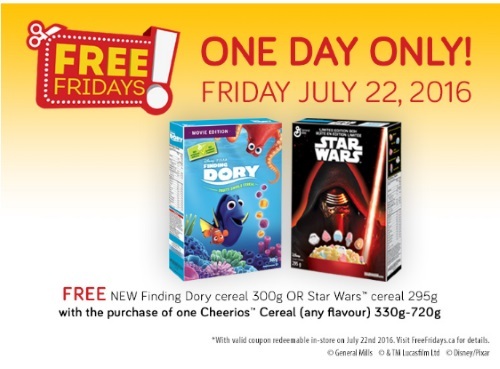 Get a Free New Finding Dory cereal 300g OR Star Wars cereal 295 with the purchase of one Cheerios cereal (any flavour) 330-720g. This coupon is valid only on Friday, July 22, 2016. This is a mail coupon, available while supplies last. Please note, you can get a second set of this coupon from the Walmart coupon portal here.